There are all sorts of qualities that writers have, but one that I don’t see discussed a lot is faith. Faith doesn’t mean you never have doubts. Faith means you wrestle with those doubts, and you don’t let them beat you. Faith doesn’t mean you never give up. Faith means that when you’ve fallen down – again and again – you get up and carry on. I can’t tell you that the writing path is an easy one. I can tell you that it’s worth travelling. And if you want to be a writer, if your life doesn’t feel complete without writing, then you already have the faith that you need. Today, faith brought you this post. I didn’t feel like writing a word. I didn’t even create an outline. I didn’t know what I wanted to say. I just knew that today, someone needed to read this. And that today, I needed to write it. Thanks. I have a blog and it isn’t conventional. I’m not sailing or promoting anything, I’m not giving advice on how to do anything, I’m not even telling about my life. It’s a fictional blog. Not in the sense where I write a blog about a fictional character (which sounds a bit interesting), but it’s just a place where I go to tell stories. I get plenty of hits the couple of days after a new post, but never any comments and I only have seven followers (one of which is myself, because my wife was signed into my google account when she went to follow it). So the last week or so I’ve been contimplating stopping it, my wife keeps telling me to just keep with it and I’ve lost much of the motivation to keep blogging. I know I’m a good story teller and am becoming a better writer (I’ve been doing it for years). So this really is just a thank you, because you were right somebody did need to read this. p.s. I may stop blogging for a bit, but I’ll never stop writing. Thanks, Bridges … and it sounds like you may have people who prefer to read by coming direct to your blog (hence the hits) rather than people who want to subscribe. I think the discipline of blogging regularly is definitely worth it: simply writing on a regular basis is such a valuable habit to get into. I was/am in the same place. My blog is the “old school” diary set up and it is by far a baby-blog. No one seems to find it. However, I started really promoting it on Fanfiction.net, and DeviantArt.com and Facebook and I’m starting to find more and more hits (only about 8 a day, but better than nothing). I finally have my first comments and I finally have my first follower and first subscriber. It kept me about two years and it’s close FB friends that let me know they regularly read. However, writing helps me sort things out, and the regular readers (even if there’s only 5 of them) tell me all the time that they enjoy my work. Kyeli’s last blog post ..Why share your heart with the world if no one’s listening? 🙂 And thank you, Kyeli … your courage and honesty on The Connection Revolution helped me write this one and actually hit publish on it. Good one, Ali. I too think that needed saying. I think we think alike. At least you keep beating me to the “draw” with topics like this. But good points. We all have our doubts at times. Is all this work really worth it? And of course it is. I would write–actually I have for years–without any guarantees any other person would ever read a word of it, although I can always count on my daughters to read my writing. Writing keeps me alive mentally and even to an extent emotionally too. It was my key to acing exams in college (when I aced them, that is!). It’s one of the best ways I know to learn. P.S,. I’m writing a review on Aliventures for my fiction writing alma mater the Longridge Writers’ Group, so I went to your site to figure out is it a blog or newsletter. Conclusion: Newsletter. That’s why I read this article of yours so quickly. You can call Aliventures whatever you like (well, so long as it’s not rude ;-)). to me, it’s a website or blog, but most of the people who subscribe do so by email (so I guess it’s probably a newsletter to them!) I also have the separate Aliventures newsletter that goes out every Wednesday, which is for quick, short pieces and brief updates on what I’m up to. These words carry more meaning than you realize. People like me need to know that we are not alone when it comes to self-doubt. I admire your honesty about not knowing what to write about and not feeling like writing. Valuable words in this post. . . Thanks Karen! I think it’s so easy for writers to give the impression that it’s effortless … when actually, we all have days when we really struggle to get the words out. I like the style of this post, not just the content. You can tell that this came straight from the heart. I regularly struggle with keeping faith that I am on the right path with my projects. I guess it is just like driving in a new city. You think you have missed the turn so you turn around, only to later realize after much searching that you were almost there. Thanks Brad, I’m really glad that the style worked … I was worried it was too different from my usual posts! And I love your analogy with driving; yes, sometimes we just don’t realise that we’re already at our destination (or even that we’ve stumbled across an even better destination). Thank you Ali. I REALLY needed to read that right at the exact moment I did. A wonderful synchronicity. 🙂 Thanks, Kate! I’m so glad this came at the right time for you. I’m so glad you needed to write this because I loved reading it. There’s never a bad time to have faith or be inspired. Ritu’s last blog post ..What’s Your Relationship To Inspiration? Thanks Ritu! And good point, faith and inspiration are always valuable, whether we’re feeling great or not-so-great. I am new to your blog but I really like it. I don’t comment a lot on blogs and I don’t even know why not because there is always something to say. I am starting to realize it is important for a blogger to know somebody is reading their words. So from now on I will comment even if it is just to say ‘I like it’. I like it! You made the choice to write, and I’m glad you did. Thanks. TNeal’s last blog post ..Are You A Part of This Story? It’s sad when authors come in for a lot of bile… I think readers don’t always realise just how much work goes into a novel (or in the case of Left Behind, an entire series). And honestly, for me, if just one reader is changed by what I’ve written, that makes it worthwhile. Like many of the commenters above, I too needed to read this post this morning (Aus time). Thank you for your generosity of spirit – it means a lot. Thank you for this post. It was something i needed to read and i’m glad you felt the need to write it. I’m new to writing and very new to blogging but it is faith and courage you need to get yourself out there. It is something you need to remember to keep going. Thank you. It is a good reminder. I have so often told friends or my children just that, however, it is difficult to grab hold of that vision for myself. There are now so many eloquent voices on the Web. I am taking steps to find my own voice and look forward to reading the e-books you created which I have recently purchased. Thanks for buying the ebooks, Johanne. 🙂 And yes, I think it’s often easier to value other people’s dreams and visions, and to let our own slide … I sometimes have to remind myself to take all the good advice that I’d want to give to a friend. I had my very first rejection recently and these words have helped me Ali. I’m picking myself back up. Slowly but surely. Faith and honesty both are craft of a writer, and both show light and give tremendous satisfaction to heart — without them a writer is incomplete! This is really inspiring. There are times when I lack faith in myself as well. I’m just wondering, what is the biggest challenge that you have as a writer? Thanks Nicole, and what a great question! I think my biggest challenge is not taking on too much at once … I always seem to have too many projects on the go. On the plus side, I’m never bored..! Brief, but from the heart. Different from your usual long informative posts, but still relevant and helpful to us faithful readers. Thanks Zac, I’m really glad that something different worked. You have poetry in your heart, Ali, what a nice piece to read today. Thanks for your contribution, as always. There is a rythm and a cadence to your words: the way you use language is like music to the ears from a favorite song. I felt like I could almost dance to the beat of this blog post. It was uncharacteristic of you to write it, but risks sometimes pay off. And how. In your childhood, you used to write poetry. Even today, that talent shows. Thanks for the continued boosts. I was particularly tickled by the lack of outline. Living on the edge! I wrote my first post today. Clicking on a ‘Suggestion’ brought me here. Good stuff. It was good to hear the responses to your “Faith” post. By the way- that title was why I didn’t go on, I stayed to read. I’m glad I did. These Aliventures bring a lot of inspiration (and good advice). Good for us you have faith in yourself. Thank you for writing this blog every Wednesday, even when you don’t feel like it, even when you may struggle to know what to write about. Your words, they inspire me to keep believing it is possible for me to write that allusive novel someday. 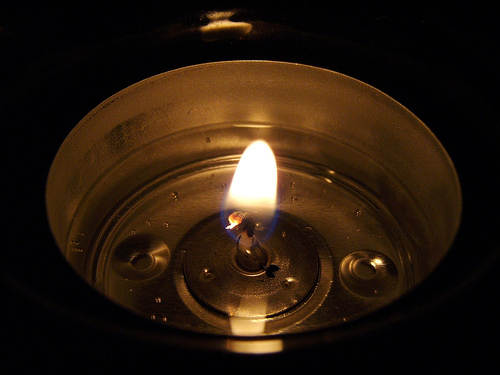 You rekindle my candle. I am not at all religious, so I have no faith in any God. However, I am a writer and there are times when I wonder, ‘Will anybody ever want my work again?’ When that feeling occurs, I verge on having more faith in a God I don’t believe in than in my own ability. I do have all the faith qualities you speak of, but sometimes get sick of the bruises after getting up from my falls. Thanks Nick… and I hope you do keep getting back up again, even after the inevitable disappointments of the writing life. If we don’t believe in ourselves, then expecting others to is ridiculous. All of us have that voice in us that loves to question things from time to time. Having faith in ourselves, and the things we are doing puts that voice on mute. Thanks for sharing that, Slavko; and I agree, we need to learn to tune out that critical inner voice. I think it can be really tough to believe in ourselves at times, but it’s important to make an effort (rather than to just give in to self-doubt). To contribute to this, I’d highly recommend “Letter to a Young Poet” by Rainard Rilke. As a songwriter, i’ve found when I lose touch of the muse, I drift towards a fog of not understanding. Rilke poses the question, “must you write?” I think it’s true for anyone that read this post, that yes we must! Thanks for the inspiration! Thanks Travis! And yes, I think we writers don’t really have much choice … writing’s in our blood! Nice post Ali! Having faith helps us in everything we do (writer or not). Thanks for being such an inspiration. Thanks for this post. I needed it today. You’re right, writing requires faith. That’s what keeps us going! Keep up the good work and congrats on publishing your book! This post definitely struck a chord. If anything, I have faith in my ability to second guess myself! Thanks, Paris. And good luck with your writing! i love the feeling i had reading this…thumbs up lady!